I recently bought a large, three-drawer organizer in order to sort my makeup better. When I imagined how I would organize my makeup, I knew there would be a drawer for all my palettes, and I was pretty sure there would be a drawer for lip products, loose shadows, and makeup pencils. What I did not realize is that I have enough foundations to fill a third drawer. It was kind of a shameful discovery for me, but it forced me to evaluate which ones I actually use on a regular basis, especially since I had room to leave a couple of foundations in my sink-top organizer instead of hiding them in the drawer. Obviously my Dior Forever Flawless makeup made the cut. But my second choice? It was actually a really easy decision: Tarte Amazonian Clay 12-hour Full Coverage Foundation ($38). This Tarte makeup ‘s star ingredient is Amazonian Clay. The story Tarte tells about this clay is that the Amazon River flows for 4,000 miles and collects nutrients along the way. Tarte harvests the clay from the river basin, where it’s said to be at its highest nutrient concentration. The claims are that this clay helps balance the oils and moisture in the skin, while improving texture and firmness. This foundation also promises full-coverage, 12-hour wear, and a weightless feel. The consistency of this makeup seems very heavy when it comes out of the tube. However, once it’s on it really is as weightless as it claims to be- it does not feel like I’m wearing foundation. It is absolutely not greasy, and I was actually afraid it might be drying, especially my skin already has a tendency to be dry, but that was not the case. 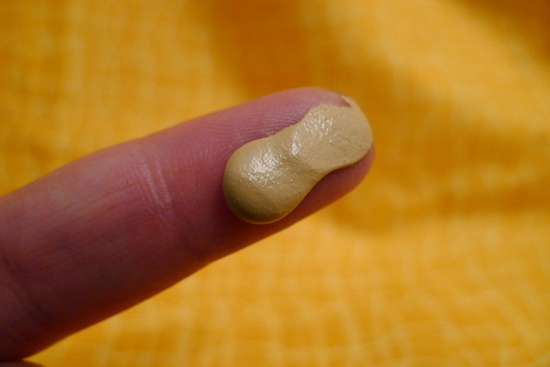 This foundation did not dry out my skin, even on my flakier days. Although it’s very thick, it spreads very easily and feels weightless once it’s on. 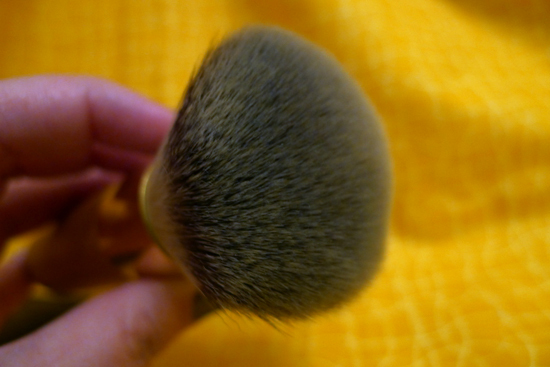 The best way I’ve found to apply it is to spread a little less than a dime sized amount over my face with my fingers, and then use the Tarte Airbrush Finish Bamboo Foundation Brush to buff it into my skin. The coverage is more medium coverage than full coverage, but it is very easily buildable to full coverage. The finish is somewhere between matte and dewy, and looks very natural. This is my hand with nothing on it. 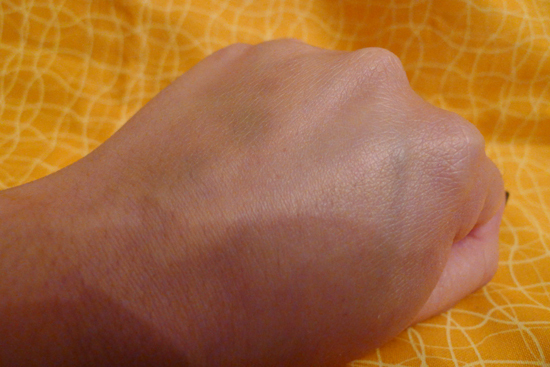 Note the bruise on the back of my hand. This is the same hand with the foundation applied. 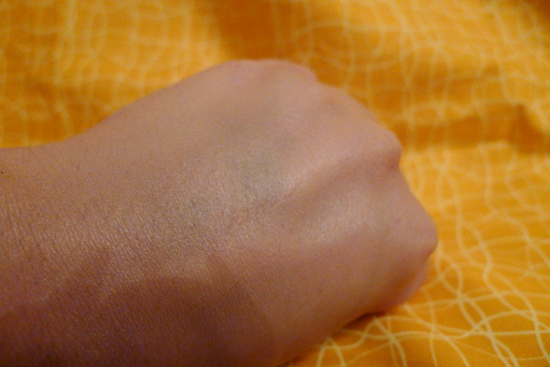 The bruise is now barely visible. Although it says it lasts 12 hours, I find that I usually need to touch it up after 7 hours, or after 9 hours if I’ve used a setting powder with it. In terms of the claims that this foundation improves skin texture in firmness – ‘ve never seen any visible changes from this makeup. However, this makeup also did not do any damage, nor did it make me break out. On the left is my face with no makeup. 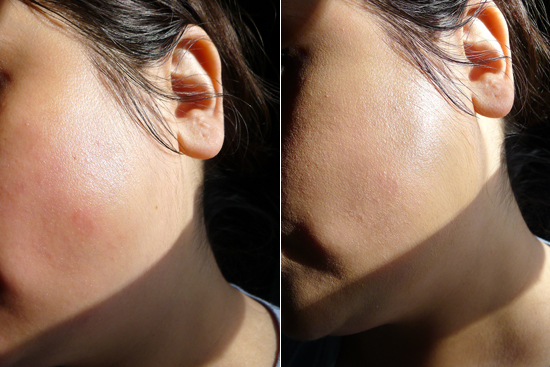 That angry, dry, red patch almost completely disappears on the right, after I’ve applied the Tarte foundation. Overall, I’m very happy with the Tarte Amazonian Clay Full Coverage Foundation. It really evens out my skin tone, looks very natural, and doesn’t feel heavy on my face. I also appreciate the SPF 15 protection it provides. I purchased my Tarte foundation from QVC. 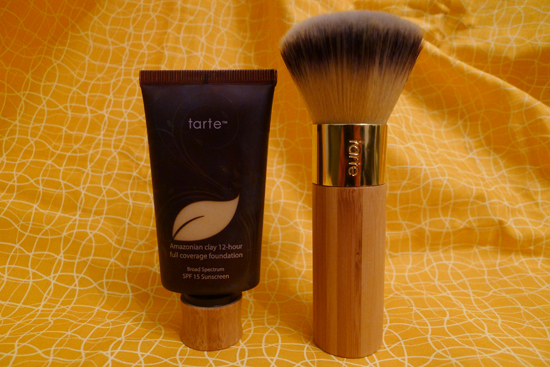 It’s also available at Sephora and Ulta, but QVC offers it with a free Tarte Airbrush Finish Bamboo Foundation Brush. That same brush is $32 on its own at Sephora and Ulta, so the QVC deal is a great value. The downside is that QVC has a smaller shade selection, and the shade closest to my skin tone (Light) from QVC is just a titch too light. Sephora and Ulta both have my perfect match (Medium-Light). This brush is $32 if you purchase it on its own, but comes free with the foundation if you get it from QVC. If you’re thinking about purchasing this foundation for the first time, I recommend buying it from QVC and getting the free brush, knowing that it’s possible the shade closest to your skin tone will be slightly too light or dark for you. The shade difference was not visible enough to keep me from wearing this foundation regularly, but I will be happy when I’m able to restock from Sephora in my exact shade. Who knows? Maybe the exact shade match will even beat out Dior as my #1 foundation choice. It’s definitely worth it. It’s expensive, but when I bought bought my first one, I wore it every day and it lasted me 7 months! My second one is lasting even longer, but only because I alternate between 5 different foundations/BB Creams. I am really tempted! I always struggle with shade. I am two shades lighter than Morticia Addams, so it’s a struggle. Lol. 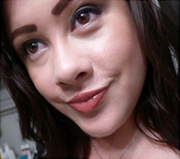 Really, I am the lightest shade or a bit lighter than most makeup lines lightest shade. I have a lot of pink in my skin tone, not much yellow. Stuff with a yellowish tint always looks odd on me, I have found. Ughhhh, I wish I knew about the QVC brush deal – I literally just threw away the box that I had from when I got it at Sephora. Next time I guess…would love that brush for free! This is my HG foundation, and they have sooo many more colors at Sephora (I’m personally Light-Medium Beige), so thanks for the tip!